UK based manufacturer Andy Pad is aiming to enter the market with an affordable and well suited 7 inch tablet. Besides an A8 CPU running at 1.2GHz the tablet is accompanied by a 3D capapble GPU and will support 1080p output via HDMI. The resistive 7 inch Touchscreen features a 480×800 pixels screen resolution. The tablet comes with Android 2.3, no words on future updates, as of now. It has 265 RAM, but it’s ROM is optimised to run smoothly with a variety of applications – even 3D games and HD video with no lag. The tablet has an USB input, that seems to support USB-host mode. 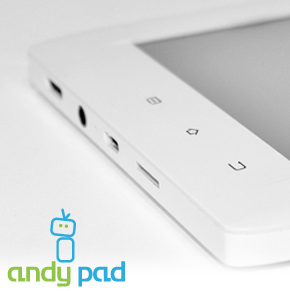 The Andy Pad is a 7” white tablet with a highly responsive resistive screen. It’s aimed at the younger generation with an aim to being a tablet for those who simply want a cheap tablet that works and isn’t like the cheap Chinese imports (IE: slow & confusing). A price of 129GBP (145€) grants an entry into the 7 inch tablet world without a financial ruin. It comes with several apps like Twitter and Facebook preinstalled. Some games are sitting on the device, too. As manufacturer Andy Pad says a Pro version is planned for the future and it will come with double the RAM and feature a capacitive touchscreen. The launch date is September 1st 2011 for the 256MB RAM with resistive touchscreen version. As announced earlier today on our Twitter (AndyPadUK), the Andy Pad will come with 512 RAM, contrary to previous statements of 256. We believe that the user experience is paramount and after a large outcry from the community, we’ve decided to use 512 RAM. The price will remain the same at 129 pounds. What do you think of the Andy Pad and it’s technical specs? Would you buy this 7 inch tablet as your first tablet?